Gems are valuable gemstones that are used to create jewelry. They can be found randomly when mining ore veins, or in random loot. A separate page details soul gems, which are special types of gems used for soul trapping. All of the items on this page are traded by jewelry merchants, and can also be sold to general goods merchants. Most gems that you find are randomly generated, meaning that most of the possible locations are the same for all twelve types of gem. The gems that appear in randomly-generated loot depends on the player's level. The "Level (Loot)" column in the following table applies to most locations where gems are found; the "Level (Merchant)" column only applies to merchant inventories. Merchants do not stock diamonds, emeralds, or any flawless gems. The leveled list is weighted so that the chances of high-level gems continue to increase as your level improves (e.g., flawless garnets are two times more likely to appear at level 6 than level 4), but there is always a chance of receiving even the lowest level gems. The following table illustrates the possible outcomes of a single gem 'loot roll' at different character levels. All Dwarven centurions are guaranteed to drop 1-3 gems. Boss chests and jewelry boxes in Dwarven ruins are guaranteed to drop one gem. Each time you mine an ore vein, there is a 10% chance of receiving one gem in addition to the ore(s) that you normally receive. Most boss chests have a 10-25% chance of containing a gem. Most other sources of random loot (chests, enemy NPCs, etc.) have a small chance (typically 1% or less) of containing a gem. An assortment of rare or unique containers such as the Confiscated Goods chests outside Riften, Aringoth's Safe, etc. This means that most of the time you will get 2-3 additional (leveled) gems. Statistically, urns and burial urns are by far the most common source of Prowler's Profit gems; it is entirely possible, assuming you loot every urn and burial urn you come across, to collect gems at a much faster rate than you will be capable of selling them. General goods merchants generally have a 25% chance of stocking two gems, but only standard amethysts, garnets, rubies, and sapphires. Note that although many of the gems listed below are guaranteed to occur, they can be difficult or even impossible to find, as gems are particularly prone to being scattered, especially during combat, and may end up coming to rest in a location where they cannot normally be accessed. One amethyst is one of two items needed at a forge to create a silver amethyst ring. An amethyst item (either an amethyst, a flawless amethyst, or a silver amethyst ring) is one of two items needed at the Atronach Forge to create a hostile storm atronach. An amethyst item is also one of three items needed at the Atronach Forge to create a sample of void salts. One diamond is one of two items needed at a forge to create a gold diamond ring. Two centered 320 feet west of Volskygge (Haafingar) (map), on the sides of the pillar at the base of the steps to the word wall. One emerald is one of two items needed at a forge to create a gold emerald ring. Two flawless amethysts are one of two items needed at a forge to create a gold jeweled necklace. Three are needed for the quest Sealing the Deal. A flawless amethyst is needed to create the Shrine of Akatosh in the cellar of homesteads with the Hearthfire add-on. Flawless amethysts were omitted from the VendorItemGem category. This means that they cannot be sold to jewelry merchants, but only to general goods merchants. One flawless diamond is one of two items needed at a forge to create a gold diamond necklace. One flawless emerald is one of two items needed at a forge to create a silver emerald necklace. Two flawless garnets are one of two items needed at a forge to create a silver jeweled necklace. One flawless ruby is needed for the quest The Only Cure. One flawless ruby is one of two items needed at a forge to create a gold ruby necklace. 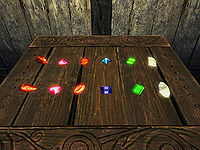 A ruby item (either a ruby, a flawless ruby, a silver ruby ring, or a gold ruby necklace) is one of two items needed at the Atronach Forge to create a hostile flame atronach. A ruby item is also one of three items needed at the Atronach Forge to create a sample of fire salts. Two flawless sapphires are needed for the quest Ringmaker. One flawless sapphire is one of two items needed at a forge to create a silver sapphire necklace. A sapphire item (either a sapphire, a flawless sapphire, a gold sapphire ring, or a silver sapphire necklace) is one of two items needed at the Atronach Forge to create a hostile frost atronach. A sapphire item is also one of three items needed at the Atronach Forge to create a sample of frost salts. Two flawless sapphires are required to craft the Aetherial CrownDG. A flawless sapphire is needed to create the Shrine of Kynareth in the cellar of homesteads with the Hearthfire add-on. One garnet is one of two items needed at a forge to create a silver garnet ring. One ruby is one of two items needed at a forge to create a silver ruby ring. One sapphire is one of two items needed at a forge to create a gold sapphire ring. These items are classified internally as gems, but have other special uses. Quest reward for the quest Blindsighted. Unlike the Left Eye of the Falmer, it cannot be used for the quest The Litany of Larceny. These are nothing more than minor loot. They cannot be used or transformed into a true soul gem. Esta página foi modificada pela última vez à(s) 23h00min de 18 de março de 2016.